This is a one stop shop for installing a washer and dryer in a laundry room. From venting, gas, electrical, and water, we have you covered with dryer venting systems and laundry room ventilation. No matter what you are looking for, we can help you track it down — and get it quickly. 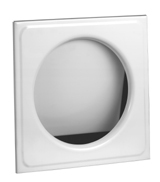 We offer same-day shipping on most dryer ventilation items. Place your order online or call us toll-free at 1-800-972-5391 if you require additional assistance with laundry room ventilation. Dryer Vents - Stocked in a variety of sizes, colors, and designs. There are choices for both wall, roof, and exterior dryer vents. Vent Pipe -Stocked in a variety of sizes for your convenience. We have items that can be used in tight locations and we stock short sections for those who need only a short length. Lint Trap Kits - Stocked in models for either outdoor dryer venting applications or indoor venting where outside access in not possible. Laundry Chute Doors - Stocked in two sizes. Backdraft Dampers - Our backdraft damper is a high quality aluminum damper that is lightweight and has a great spring that will work in low pressures situations such as with bath fans or dryer ventilation. 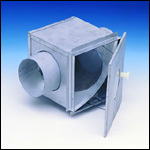 Dryer Booster Fans -We have several models that will work in a variety of situations and budgets. We can provide pressure switches for automatic control with simple wiring requirements. Ductwork Fittings -Get all the pipe fittings you need to install your dryer vent, including elbows, wyes, reducers, and other dryer vent piping options.